Happy July 4th!!! Let us all appreciate & be reminded that freedom isn't free :) For me this day represents summer time FUN. 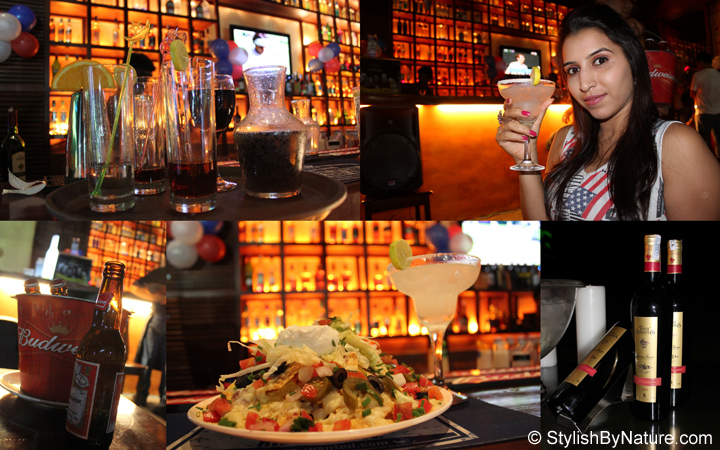 So, planned and had a rocking time on 4th of July bash at Habanero - Truly Tex-Mex Restaurant. In the true spirit of the day, I dressed in the stars and stripes. 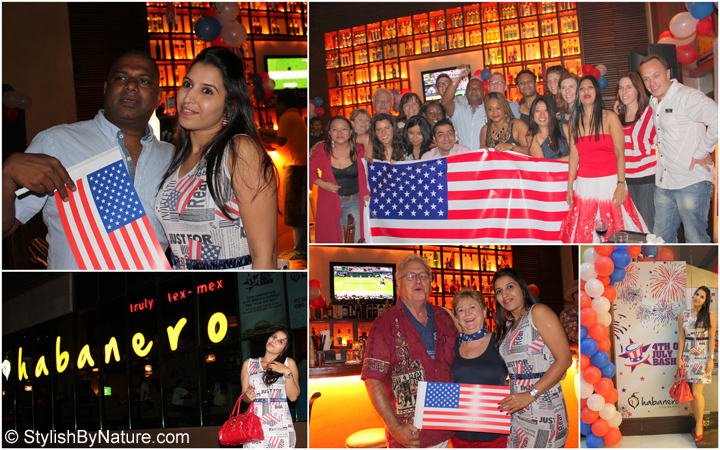 Celebrate 4th of July the American way at Habanero !! Enjoy all-American barbecue and beer. Groove to some of the best of country music, jazz, blues and more. 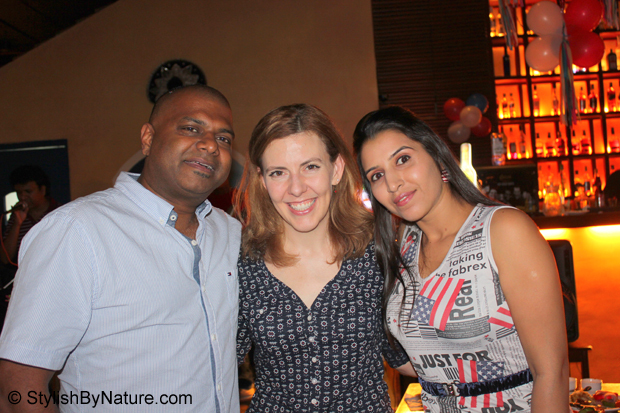 Perhaps Habanero is the only place in Bangalore to be hosting an event of this nature for all expats especially - when it comes to recreating the holiday and festive feel surrounding the day. The event started today at 11:00am until July 5 at 12:00am and was even Featured in Times of India on the 4th of July... Click here to read more. 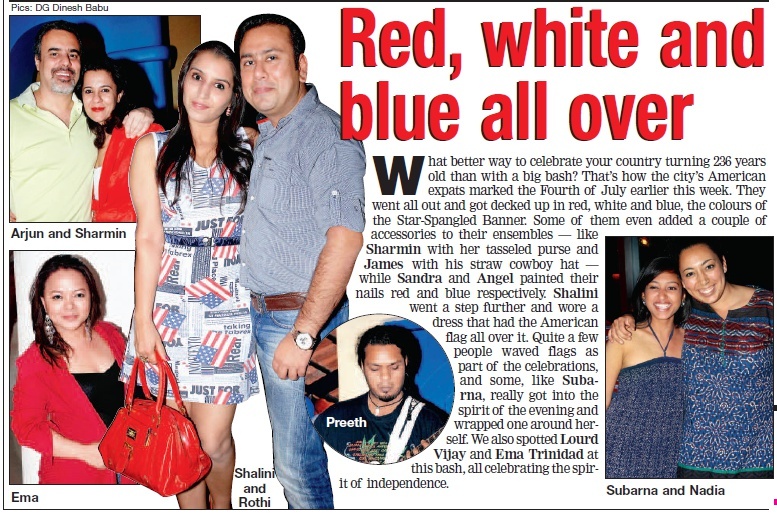 Not only US Nationals, but also, Indian counterparts were in high spirit of the event to celebrate 246th Independence Day. Most lively and bubbly Guests ever !! "We've arranged for a band. I've been in this city for seven years and each time, I try to do something different. 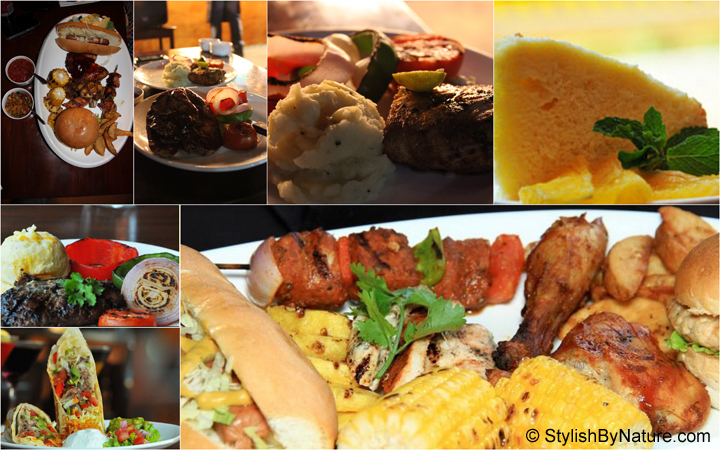 We'll serve some signature American dishes, and I'm sure people are going to love it." A warm, welcoming atmosphere, Habanero is a vibrant spot to kick back and relax with friends and family. In fact, its a true refection of Griffith David's (owner, Habanero) personality. Griffith is gem of a person, fun loving and perfectionist to the core. According to him, he makes sure that they have authentic Mexican ingredients in their kitchen, to ensure the customers leave with the true flavors in their mouth and come back asking for more. With flat-screen TVs and a performance area, it is also an ideal place to gather to watch a sporting event or to enjoy live music. Habanero is an expert in introducing tex-mex culture, cuisine and flare for enjoyment. 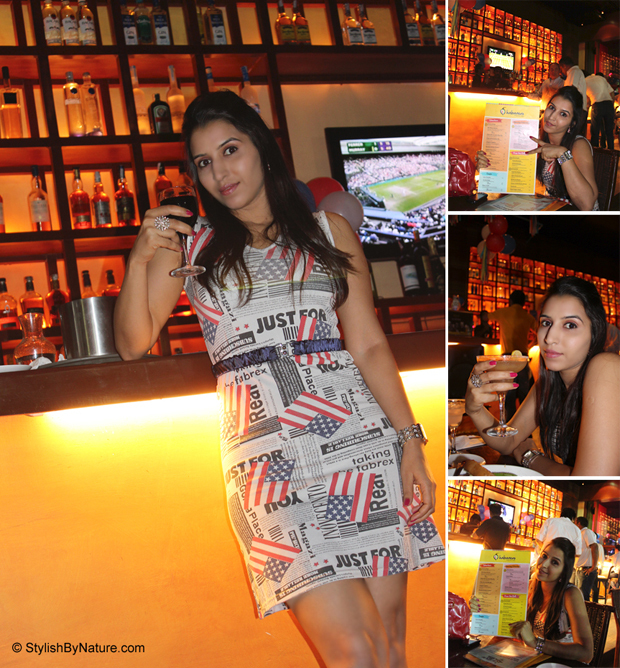 With Online Partner - SpiritzandMore the event couldn't have been more kicking.Though the special menu for the day was a highlight in itself, I really enjoyed the regular menu, which features hearty vegetarian and non-vegetarian fare. It features all three - classic Mexican foods, Tex Mex creations, and Texas-influenced American items. Highly recommend nachos, burritos, quesadillas, and burgers, as well as grilled chicken breasts, fish, and tenderloin. Classic drinks such as Margaritas and Four Seasons Sangria go perfectly with the cuisine. Sweet endings to the meal range from the distinctively Mexican tres leches cake, to the deep American South treat of pecan pie. 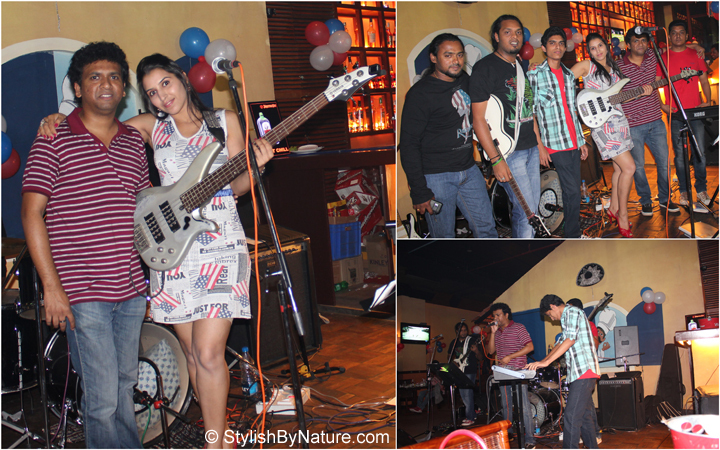 Located at - Ascendas Park Square, ITPB, Whitefield, Bangalore, India, Habanero is the place to be. Mi sono innamorata del tuo vestito!!! so lovely photos dear, ur look is very cute! :) kisses! As soon as I saw your title, I immediately felt like eating some ribs!! love the dress! hope you had fun! wow, the food looks delicious! and ur dress is perfect for the ocassion! Very patriotic dress! The food looks so yummy! Love that dress!!!!!! Very nice, looks like you had fun! Everything looks great I'm a huge fan of Mexican food and Habanero looks yummy great post and pictures. I love love love your dress!!! What a nice place, the food looks delicios and I love your dress! Looks like it was a fun event! U look great as usual.! oh gosh the food ..torture! !